The Titanic Museum is one of the most amazing attractions in Branson where you can see great display of over 400 artifacts and countless exhibits. The top 3 artifacts that are must-see at Titanic Museum in Branson include the violin, the bible, and the memorial wall that lists the names of 2,208 Titanic passengers and their stories. 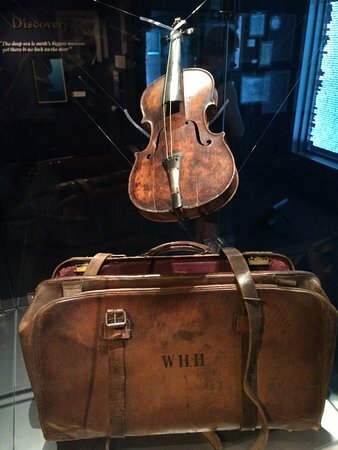 The violin is one of the artifacts that is on display at the Titanic Museum in Branson. This violin was brought onboard the Titanic by Wallace Hartley who led the band that would play on the ship’s maiden voyage. When the Titanic hit an iceberg early on the morning of April 15, 1912, it began sinking and the eight-member band was instructed to play continuously so the passengers wouldn’t panic. Hartley’s body was found floating face up with a large leather valise case – a Gladstone bag – with a nine-foot strap and the initials, W.H.H. and strapped to his chest. Harley strapped that bag around his body, and he’s got his arms clutched on top. Inside the bag, wrapped in a bundle of clothing, was his beloved violin. The violin was given to his father, and since the violin was a gift from Maria, Hartley’s fiancee, Hartley’s father gave it back to her. She kept it until her death years later. Maria never married her whole life. It changed hands many times and was discovered ten years ago in England in the attic of the home of an elderly lady who had passed away. The elderly lady’s son took the violin and wanted more information about it and took it to Aldridge & Sons auction house in England, and the violin went through seven years of forensic investigation. And it was determined that it was really Wallace Hartley’s violin that had been on the Titanic. In October 2013, the violin was sold at auction by a company known as the world’s leading Titanic auctioneers, Henry Aldridge & Sons Auction House in Devizes, England to an anonymous bidder for $1.7 million. Recently, the Titanic Museum in Branson was awarded world exclusive rights to display the violin. Another artifact on display at the Titanic Museum is the bible that survived from the sinking of the RMS Titanic. Best known as the Titanic Bible, this King James version bible belonged to Rev. Robert J. Bateman, who founded the People’s Tabernacle Church in Knoxville, TN. At the time of the sinking of the Titanic, Rev. Bateman handed the bible to his sister-in-law, Ada Ball before she boarded the lifeboat. On her safe return, she handed the bible to her sister, Emily, Bateman’s wife. The bible have been on display at the Titanic Museum in Branson since 2016. You can also see the memorial wall inside the Titanic Museum that features the names of 2,208 Titanic passengers and their stories. Of the 2,208 passengers of the Titanic, 133 of them were children. The Titanic Museum is an eye-catching attraction in Branson where you can see the top 3 artifacts that come from the ill-fated luxury ocean liner RMS Titanic.